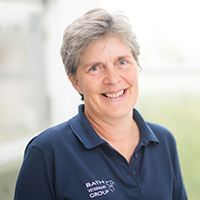 Helen is the Practice Manager for Bath Veterinary Group looking after all our day to day business processes and group practice management. Helen has a degree in Agriculture and spent many years working in agricultural research and as an agricultural consultant. For the last 10 years Helen has worked as a veterinary practice manager and in December 2007 she gained her Certificate in Veterinary Practice Management. Helen joined Bath Veterinary Group in January 2010.